Ben Alnwick claps the Posh fans at full-time at Millwall. Posh manager Dave Robertson has warned his under-performing players that they have no hiding place on Saturday (September 5). 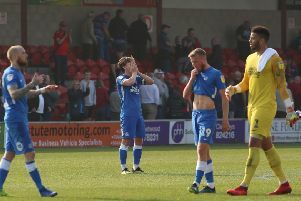 Posh, who have not won any of their last five competitive matches, are not just perfoming in front of their own fan base at Southend, they will be on display to the nation as the match is being televised live by Sky Sports (12.05pm kick-off). Posh also have to break a TV hoodoo. Since hammering Ipswich 7-1 in August, 2011, they have won just two of 12 live TV games, discounting penalty shoot-outs. “The players just have to pick their performances up now,” Robertson insisted. Posh completed just two bits of business on transfer deadline day this week. Central defender Alex Davey extended his loan from Chelsea to January 2016, while Jack Payne moved on loan to League Two side Leyton Orient until the end of the season. Payne remains under contract at Posh until 2017 so the club still expect to claw back some of the reported £700k they paid Gillingham for his services in 2013. Posh signed St Patrick’s Athletic midfielder Chris Forrester for an undisclosed fee last weekend and took Leicester left-back Callum Elder on loan for a month. Central defender Gaby Zakuani (DR Congo) and Jermaine Anderson (England Under 20s) miss the Southend game because of international call-ups.